BEDMINSTER, NJ--(Marketwired - Aug 27, 2014) - The Investment Center, Inc. (TIC), an independent broker-dealer, is proud to announce that it won Broker-Dealer of the Year for 2014, by Investment Advisor magazine. In voting overseen each year since 1991 by Investment Advisor's editorial staff, credentialed voters are asked to rate their own broker-dealers in 15 different categories. The broker-dealers that receive the highest average rating from their advisors are named Broker-Dealers of the Year in four divisions based on their number of producing representatives. TIC garnished top votes and won Division II -- broker-dealers between 200-499 producing advisors. TIC is named Broker-Dealer of the Year for an unprecedented five times by the magazine. Previous winning years were 2006, 2008, 2009 and 2011. In addition to the truly exemplifying honor, all leaders in the four winning divisions attended a special broker-dealer advisory board in Chicago, IL earlier this month. The discussions are featured in an extensive cover story in the September 2014 issue of the magazine. "We are humbled to have received this prestigious award for the fifth time," stated Ralph J. DeVito, president and CEO. "The fact that our advisors voted us with high marks is rewarding and goes to show the dedication and hard work every manager and employee strives for daily to achieve this victory. Our advisors come first and we stand strong to serve them with excellent customer service every day. We thank our advisors for their vote." The 15 different categories the advisors voted on included compliance, due diligence, back-office support, training, marketing support, trading, clearing services, product list, management, payout, timely payment of commissions, technology support, communication with the home office and fee programs. Established in 1986, The Investment Center, Inc., is an independent broker-dealer with over $6.2 billion in assets under management. (Member FINRA/SIPC) based in Bedminster, NJ serving approximately 300 financial advisors. 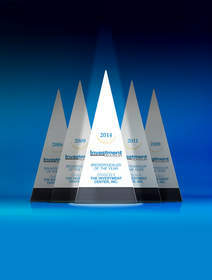 For more information about TIC, visit www.investmentctr.com, five time winner of the "Broker-Dealer of the Year" award. About this company The Investment Center, Inc.
Broker/Dealer of the Year - Division II The Investment Center, Inc.